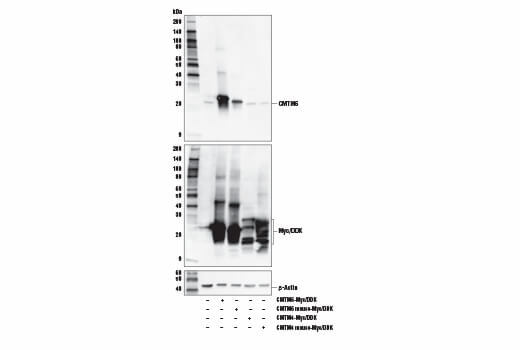 Western blot analysis of extracts from various cell lines using CMTM6 Antibody (upper) and β-Actin (D6A8) Rabbit mAb #8457 (lower). Western blot analysis of extracts from 293T cells, mock transfected (-) or transfected (+) with constructs expressing Myc/DDK-tagged full-length human CMTM6 (CMTM6-Myc/DDK), Myc/DDK-tagged full-length mouse CMTM6 (CMTM6 mouse-Myc/DDK), Myc/DDK-tagged full-length human CMTM4 (CMTM4-Myc/DDK), Myc/DDK-tagged full-length mouse CMTM4 (CMTM4 mouse-Myc/DDK), using CMTM6 Antibody (upper), Myc-Tag (71D10) Rabbit mAb #2278 (middle), and β-actin (D6A8) Rabbit mAb #8457 (lower). 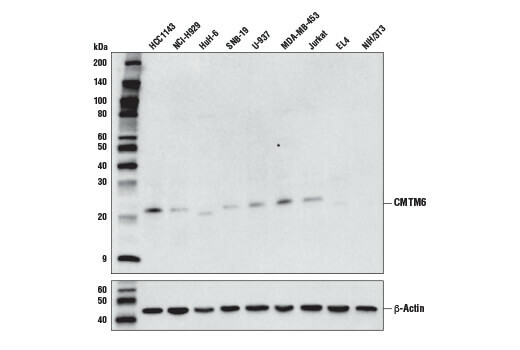 CMTM6 Antibody recognizes endogenous levels of total CMTM6 protein. This antibody does not cross-react with CMTM4 protein. Polyclonal antibodies are produced by immunizing animals with a synthetic peptide corresponding to residues surrounding Ala176 of human CMTM6 protein. Antibodies are purified by protein A and peptide affinity chromatography. CKLF-like MARVEL transmembrane domain-containing protein 6 (CMTM6) is a member of the chemokine-like factor (CKLF)-like MARVEL transmembrane domain-containing family (1). CMTM6 stabilizes plasma membrane expression of PD-L1, an immune inhibitory ligand critical for immune tolerance to self and anti-tumor immunity (2,3). CMTM6 associates with PD-L1 at recycling endosomes, where it protects PD-L1 from being targeted for lysosomal degradation by preventing STUB1-mediated PD-L1 ubiquitination (2,3). CMTM6 may stabilize PD-L1 expression on antigen presenting cells and potentiate inhibitory signaling by PD-1 on T cells, triggering T cell inhibition and exhaustion. CMTM6 has also been shown to interact with with CD58, ARG1, ENO1, and TMPO (2). Due to the role of CMTM6 in regulating the immune system, it is being investigated as an immunotherapeutic target for the treatment of cancer. Han, W. et al. (2003) Genomics 81, 609-17. Burr, M.L. et al. (2017) Nature 549, 101-5. Mezzadra, R. et al. (2017) Nature 549, 106-10.